No acting here. Meryl Streep praised Hillary Clinton during an impassioned speech on night two of the 2016 Democratic National Convention in Philadelphia on Tuesday, July 26. The Into the Woods actress, 67, took the stage shortly after Clinton, 68, was officially named the Democratic presidential nominee. 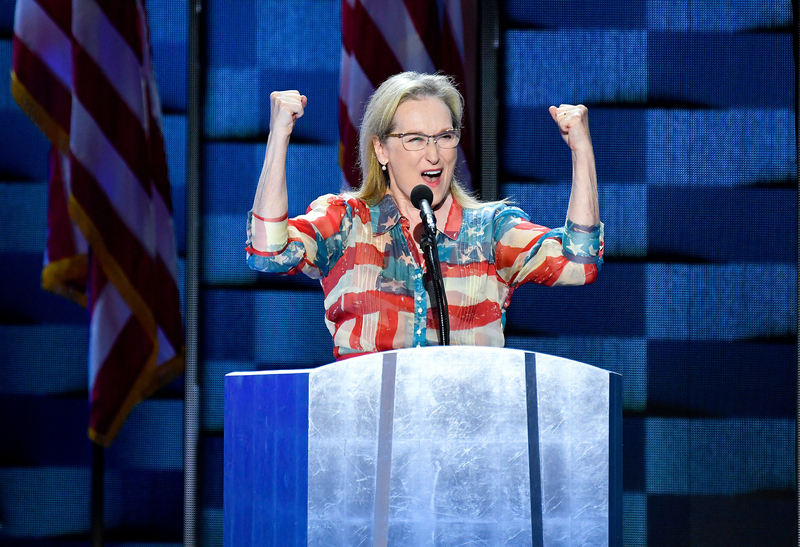 Clad in an American flag–patterned dress, Streep explained what Clinton has in common with other famous female trailblazers before her. "What does it take to be the first female anything? It takes grit, and it takes grace. Hillary Clinton has taken some fire over 40 years of her fight for families and children. How does she do it? That&apos;s what I want to know. Where does she get her grit and grace? Where do any of our female firsts, our path makers, where do they find that strength?" Streep asked the crowd at the Wells Fargo Center. "Sandra Day O&apos;Connor, Rosa Parks, Amelia Earhart, Harriet Tubman, Sally Ride, Shirley Chisholm, Madeleine Albright, Geraldine Ferraro, Eleanor Roosevelt. These women share something in common," she continued. "Capacity of mind, fullness of heart and a burning passion for their cause. They have forged new paths so that others can follow, men and women, generation on generation. That&apos;s Hillary. That&apos;s America." Streep has voiced her opinion about politics before — on screen and off. Last year, she played British political activist Emmeline Pankhurst in Suffragette, a movie about the early feminist movement. And in February 2015, she memorably cheered on Patricia Arquette&apos;s Oscars speech about women&apos;s rights and equal pay. "Nearly 100 years after women got the vote, you people have made history," Streep continued on Tuesday. "And you’re going to make history again in November because Hillary Clinton will be our first woman president, and she will be a great president. And she will be the first in a long line of women, and men, who serve with grit and grace. She&apos;ll be the first, but she won’t be the last." Streep has been Team Hillary for quite some time. Last month, she poked fun at GOP presidential nominee Donald Trump during a performance of "Brush Up Your Shakespeare" from the musical Kiss Me, Kate at the Shakespeare in the Park Public Theater Gala in NYC. She wore a wig, padding under her jacket and an excessive amount of orange bronzer. Watch Streep&apos;s DNC speech in the video above.